The animal kingdom of the Baikal basin is rich and diverse. The basin’s fauna is unique due to a peculiar geographic location of this region, which explains the extreme diversity of the species composition including many genetically and environmentally heterogeneous elements. In this region, the contact and overlapping of many systemically and ecologically close species and subspecies take place. A large number of forms is represented by the periphery and even isolated populations preserved in the local refugiums since the last glacial period. As a rule, all these species are relatively rare and small in number, and their habitats cover a small territory. Therefore, all of them have been listed in the Red Books and require special protection. A series of maps of this section provides an insight about the spread of rare species of animals grouped according to their systematic features into separate categories: fish, amphibians and reptiles, birds and mammals. The maps show the main habitats of rare species based on the literature and museum collection research, as well as personal observations of the authors. The maps also show home ranges of certain species. More than 60 species of fish live in rivers and water bodies of the Baikal basin with half of them being endemic or relict species. The indigenous ichthyofauna of the Baikal basin’s rivers and lakes formed on the basis of the species of the boreal piedmont, boreal lowland, and arctic freshwater complexes; only the Siberian sturgeon and tench are remnants of the ancient late Tertiary faunal complex. Species representing other faunal complexes got into these water bodies as a result of introduction or invasion. In Lake Baikal, the level of endemism reaches 55% of all fish species, which is indicative of the autochthonous nature of the formation of the nucleus of the lake’s ichthyofauna. Only 10 species of fish are found in Lake Khovsgol, with half of them being valuable commercial fishery species. More than a half of the fish species listed in the regional Red Books of the Russian Federation and Mongolia are valuable commercial fishery species. However, their number has been significantly reduced due to the intensive human economic activities over the past 100 years. Overfishing, construction of hydro-technical facilities, and water body pollution negatively impacted their population and resulted in the partial loss of habitat. Today, 15 fish species in the Baikal basin require protection and artificial breeding in order to restore their number. The Baikal basin is characterized by a low diversity of species of the herpetofauna (altogether about 20 species) due to harsh weather conditions in the region and the history of faunal formation. On the other hand, the basin is a place of contact of the habitats of the Western and Eastern Palearctic species, while representatives of the Central Asian and Daur-Mongolian fauna are wedging in from the south. Half of the species inhabiting this area are located on the periphery of their habitats. Anthropogenic transformation of habitats, drainage and contamination of water bodies, frequent fires, high recreational stress, and extermination by humans decrease the number and fragment the habitats of many herpetofauna species. At present, four amphibian species and six reptile species need protection. Peculiarity of natural landscapes, climatic and geomorphological conditions, and the historical process of the formation of the ornithofauna resulted in its species diversity. The nucleus of the structure of the population of the basin’s ornithofauna is composed by representatives of the Siberian, Mongolian, Chinese, European and Arctic types of fauna. Transpalearctic species also make up a sizable proportion. Species of the Tibetan and Mediterranean types of fauna make up only a small share of species. Modern ornithofauna of the Baikal basin includes over 400 species; about 100 of them need protection. Human economic activity ambiguously impacts the structure of the ornithofauna. Transformation of the environment as a result of logging, fires, overgrazing, or steppe ploughing may decrease the number of some species, but, on the other hand, it may expand the habitats or the number of other species. Stenobiontic species are affected by economic activity the most. Transformation of habitats, changes in the hydrological regime of certain rivers and Lake Baikal, poaching, logging, fires, and technogenic emissions, all against the backdrop of fluctuations of environmental and climatic conditions, result in the decrease of diversity and number of the majority of bird species. The fauna of mammals is quite specific and diverse including over 90 species. Many of these species are located on the periphery of their ranges. The modern mammal fauna of the basin is represented by almost 20 faunulas, the largest of which in terms of the number of species are the following: the Holarctic arctic boreal, taiga Palearctic, western Palearctic taiga, Holarctic tundra and golets, steppe southern Palearctic, and Central Asian elements, as well as the East Asian and southern Palearctic flying mammals. A small number of species of the basin either acclimatized or followed the humans. Compared to other animals, mammals are more affected by the direct anthropogenic impact. Thus, the majority of mammals listed as rare species in the near past were or still are considered as game animals, but their population was sharply reduced due to unregulated hunting and poaching. It is not uncommon that the activities aimed at preventing zoonotic infectious diseases led to a sharp decrease of infection hosts – rodents. Logging, steppe ploughing, overgrazing, frequent fires, and the fragmentation of natural territories devastatingly impacted the majority of mammalian species inhabiting the Baikal basin. Therefore, over 30 species now require special protection and reproduction. 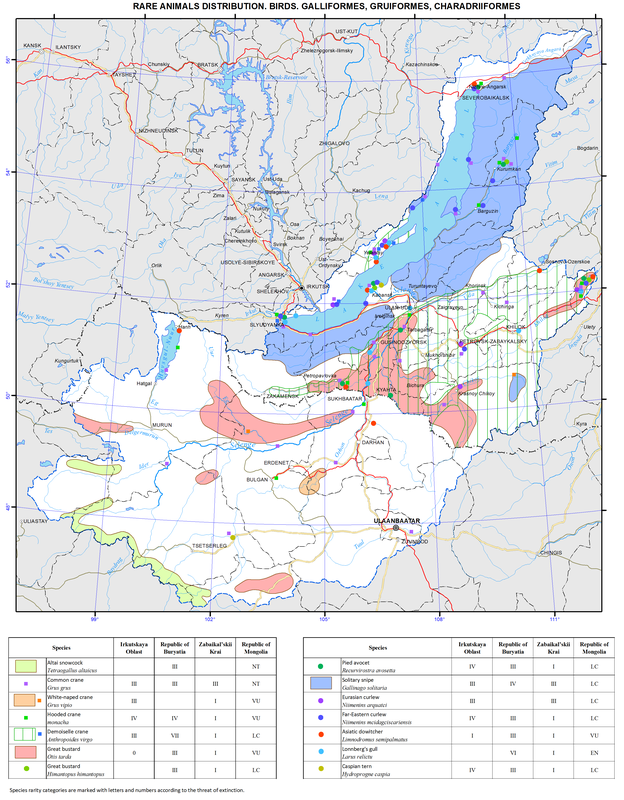 The Red Books of the Russian Federation (2008) and Mongolia (1997), as well as regional Red Books of Irkutsk oblast (2010), Republic of Buryatia (2013), and Zabaikalsky krai (2012) were created to protect rare and endangered species. The categories set forth in the Red Book of the Russian Federation (2008) were used as a basis for the development of the regional categories of rarity and the degree of endangerment. Minor amendments were introduced to reflect regional characteristics of the biota. In particular, two regional categories (VI) and (VII) were included due to geographic features of the Republic of Buryatia (location near state border, existence of major biogeographic boundaries and important migration routes, and so on). The categories of the IUCN were used for rare species of vertebrate animals in Mongolia. The Red Book of Zabaikalsky krai: Animals. (2012). Novosibirsk: Novosibirsk Publishing. p 344. The Red Book of Irkutsk oblast (2010). Irkutsk: Wind of Travel Publishing. p 480. The Red Book of the Republic of Buryatia: Rare and endangered species of animals, plants, and mushrooms. (2013). Ulan-Ude: BSC SB RAS Publishing. p 688. The Red Book of the Russian Federation: Animals. (2001). Moscow: Astrel. p 862. Mongolian Red List of birds. (2006). Ulaanbaatar: ADMON Printing. p 1036. Mongolian Red List of fish. (2006). Ulaanbaatar: ADMON Printing. p 68. Mongolian Red List of mammals. (2006). Ulaanbaatar: ADMON Printing. p 96. Mongolian Red List of reptiles and amphibians. (2006). Ulaanbaatar: ADMON Printing. p 68.